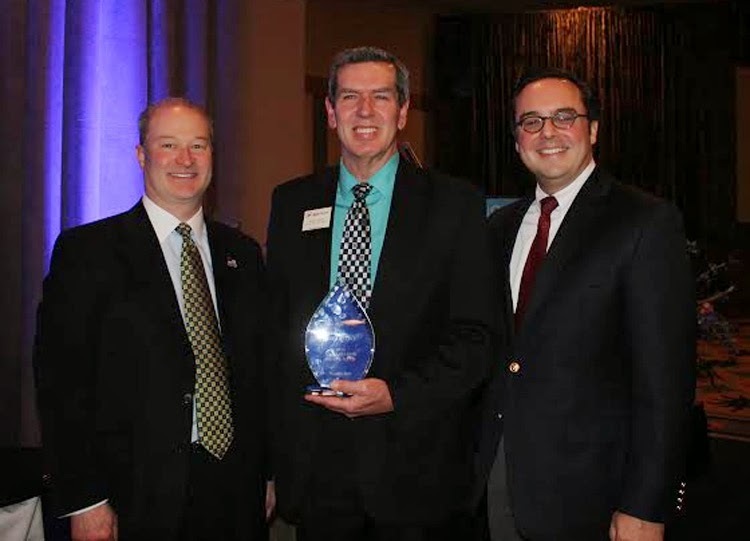 KANSAS CITY, KAN. ----- Mike Stone, Spangler Graphics (center), was awarded the Ambassador of the Year at the KCK Chamber’s Annual Meeting on March 7. Pictured with Stone is Todd LaSala (right), Partner at Stinson Leonard Street and KCK Chamber Board Chairman; and Pat Warren (left), President of Kansas Speedway and KCK Chamber Board Member. Kansas Speedway was the 2014 Annual Meeting Presenting Sponsor. Transformation: Building on Success was the theme. Keynote Speaker was Bill Graves, President and CEO, American Trucking Associations and former Kansas Governor.